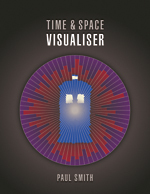 To mark the impending publication of my latest book, The Classic Doctor Who DVD Compendium, I’ve reduced the price of last year’s Time & Space Visualiser: The Story and History of Doctor Who as Data Visualisations by 20% to just £19.95/$30.30 (minus whatever further discount Amazon applies). The book is 200 full-colour pages, packed with charts, diagrams and infographics about every aspect of the show’s production, fiction and transmission, providing a unique perspective on the Doctor’s 50 years of adventures. Visit the Wonderful Books website to view samples, read reviews and find links to Amazon to buy.